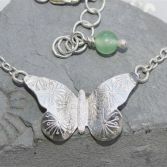 My Textured Butterfly Necklace has been designed handcrafted in the workshop by me. The large chunky Butterfly has a pretty decorative flower pattern stamped into the wings, the wings are shaped and curved as if the Butterfly is in flight. The Butterfly is made from solid sterling silver and measures 32.0 mm at the widest point by approximately 20.0 mm. 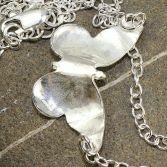 It hangs on a strong sterling silver trace chain with links that measure 3.0 mm by 2.50 mm, the necklace can be made to length either 16'' inches or 18'' inches and will include an extension chain so it can be made slightly bigger if required. The extension chain is finished with a wire wrapped semi precious bead (green Aventurine) select your chain length using the drop down option below. 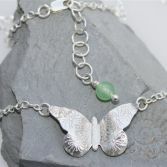 The Textured Butterfly necklace has full UK hallmarks. If you would like your Butterfly with blue black oxidised finish then please use the drop down option below to select finish option. Your Textured Butterfly Necklace will be presented in one of our signature gift boxes and posted via Royal Mail special delivery (signed for) to any UK address free of charge.